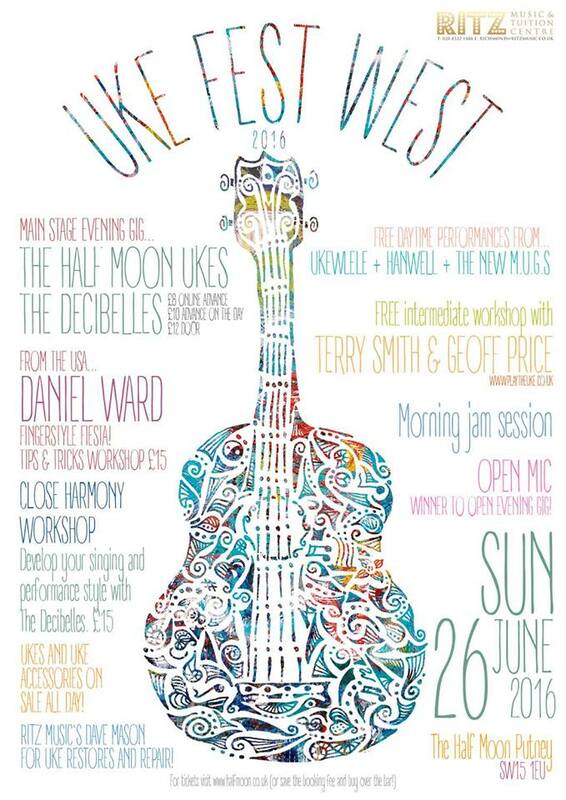 Uke Fest West is a localised festival, filling a gap in the festival scene in the West of London. 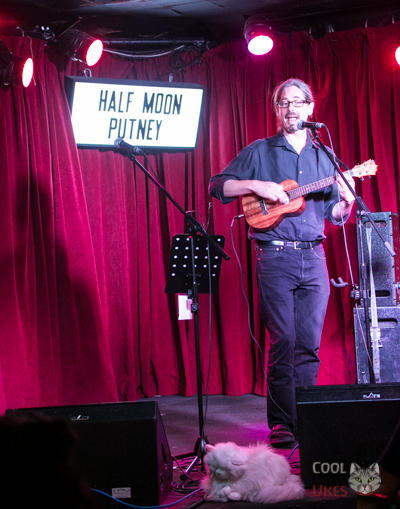 It's based at the Half Moon in Putney, a well-known music venue. It's an all-day event, with workshops and a jam as well as an open mic - whoever is judged the winner gets to open the show in the evening. I arrived at about 5pm, to the sound of the Decibelles running their workshop. Paul Redfern was hosting the open mic outside in the garden, and others were huddled around table practicing all sorts of techniques. Certainly a lot going on for what is quite a small festival. The evening concert was opened by Paul with a couple of songs, one being "Forever Young" for a friend from the band The Pukes who had just passed away. A moving and fitting tribute. Then, the evening opened proper. Daniel Ward, on tour from the US started his set. Appropriately for us, "Aire For The Cat Rancher" was in the set along with "Lucila" - a great sing along, "Silly Love Songs" and "Aloha Oe". Daniel was here after a tour of the UK, including performances at The Ukulele Festival of Great Britain in Cheltenham and Unplugthewood. 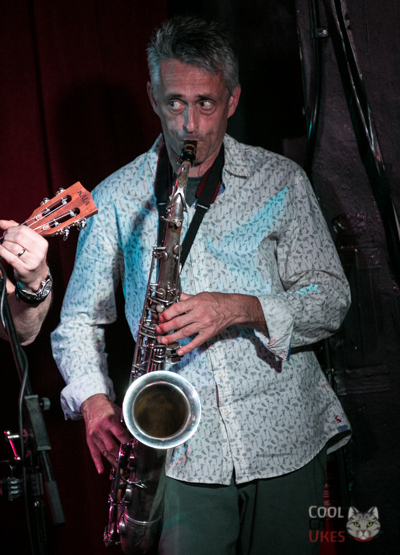 After Daniel had shown us all how it should be done, local band Don't Tell Smith took to the stage featuring festival organiser Tara Maysey and sponsor Simon Taylor (now THERE's a great name), from Ritz Music in Richmond. The Decibelles followed up, notable songs being the comic "Trolley Angel", Gnarls Barclay's "Crazy" was exceptional. "I like Bananas" was a very intersting take. Guns 'n' Roses "Sweet Child Of Mine" was very clever, complete acapela, building up the riff in separate voices. 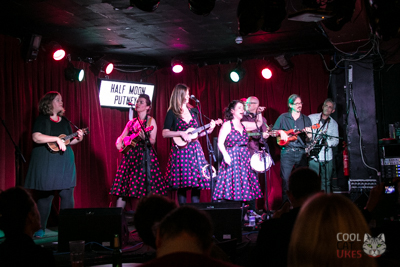 The Decibelles could be described as a close harmony trio, sometimes acapela, sometimes with ukulele. Very entertaining, though, and a polished performance. The audience numbered about fifty in the evening, there's space in this venue for more. Certainly, it's easy to get to, being in West London, and one to put in the diary for next year. We've made a short video so you can get a taster of the day, a nice, intimate little festival, nothing pretentious, and it's not on a huge scale like the Grand Northern of course, but a very pleasant way to spend a Sunday!